and U.S./Japan ASTER Science Team. The Thomas Fire burned throughout the month of December, destroying over 1,000 structures and becoming the largest wildfire in California history. The immediate cost escalated over $300 million, plus an undetermined loss of property. 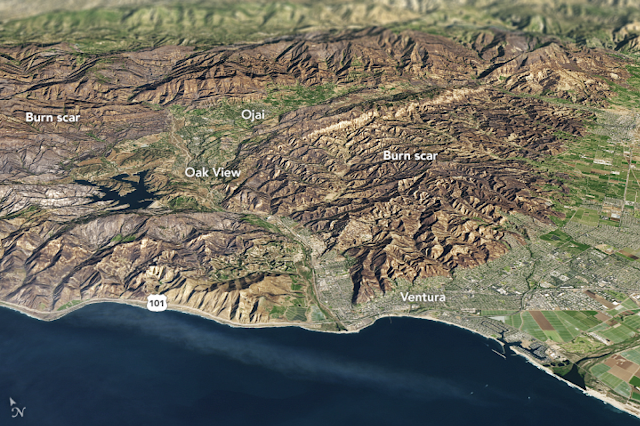 Almost 300,000 acres of open space has been transformed, including most of the Ventura River watershed. Although the fire overwhelmed first responders on the night of December 4th, the subsequent mobilization and coordinated response of thousands of firefighters ultimately saved the populated areas of the Ojai Valley. 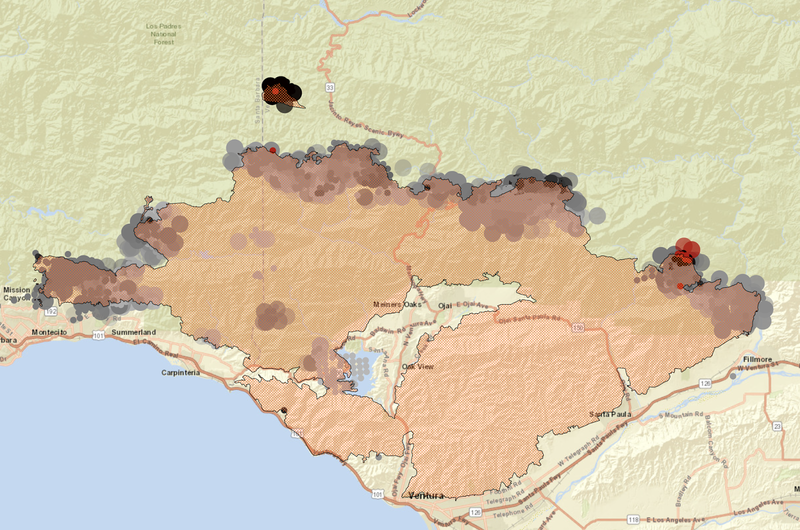 • Wild fires can threaten local water quality and supply. Moderate wild fires occur once every 10 years on average, and extreme wild- fires once every 20 years. – Fifty-four percent of the watershed burned in the 1985 Wheeler Fire. – Wild fires threaten water supplies largely by causing damaging sedimentation and siltation of reservoirs. Equipment damage, interrupted power supply, ash deposits, and use of water for re suppression are other potential impacts. The Thomas Fire will undoubtably have a major impact on the Ventura River watershed for the foreseeable future. Increased sedimentation will lead to severe flood risk, and significantly reduce the capacity of Lake Casitas and ability to divert water from the Ventura River at the Robles Diversion. Detailed analyses of sediment transport have been conducted for the Matilija Dam Ecosystem Restoration Project. It has been estimated that approximately one half of the 7 million cubic yards of sediment trapped in Matilija reservoir was delivered during the 1969 El Nino storms which followed a fire in Matilija canyon. 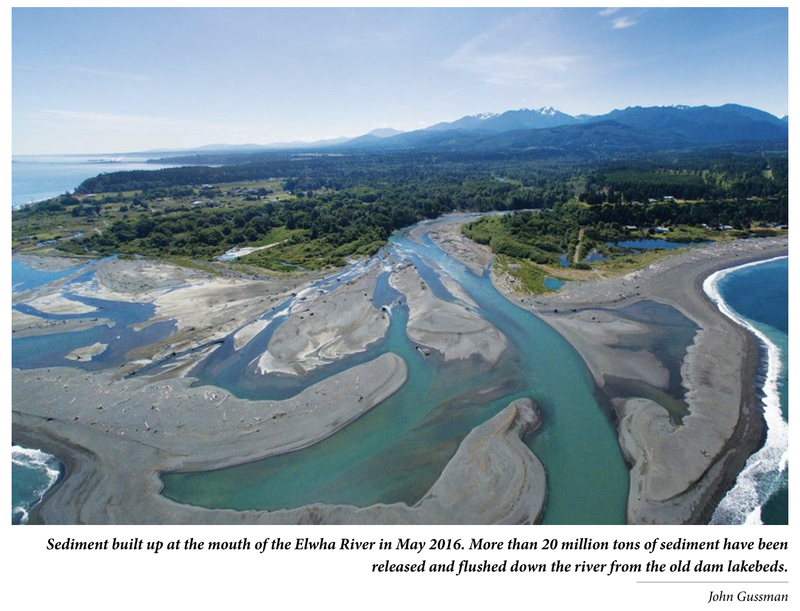 Studies estimate that the reservoir will be filled with sediment by 2030, at which point coarse sediment (sand, gravel, and cobble) will begin to pass downstream. That process has now been accelerated. Computer modeling identified deficiencies in the downstream infrastructure's ability to withstand an increase in sediment loading with dam removal. The sediment regime has now been altered, and future modeling under the Prop 1 grant will need to account for these changes. Meanwhile, it is likely that the next major flood will deliver sediment loads in excess of that expected with dam removal, placing downstream communities at risk. 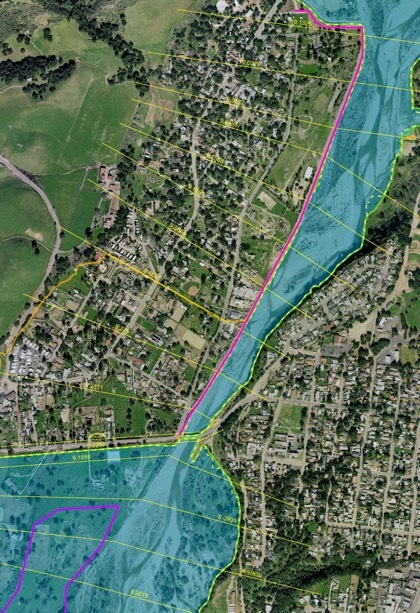 For example, the image here illustrates how the Santa Ana bridge and Live Oak levee in Oak View create a choke point in the river which is likely to back up and overflow with high sediment loads in the river. "If substantial rain comes down, I expect sediment and debris to flow over the spillway," said Peter Sheydayi, deputy director at Ventura County Watershed District. "We're in the midst of working on risk reduction measures such as installing debris flow sensors to determine whether evacuations are needed." 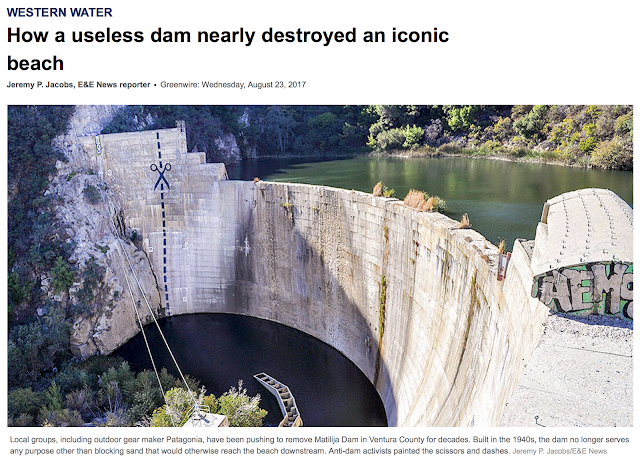 "The dam itself," he added, "is safe." Paul Jenkin, an environmental activist in Ojai and founder of the Matilija Coalition, a nonprofit group dedicated to restoring the Ventura River, is not so sure. Surveying the structure from an overlook and shaking his head in dismay days before the rain, Jenkin said, "Obsolete dams like this one are ticking time bombs." Officials say there are roughly 8 million cubic yards of debris behind the dam now. "So the next big storm will push huge amounts of mud and water over the top, overwhelming bridges, culverts and roads below," Jenkin said. Sea level rise and erosion are major threats to California’s coast, requiring solutions to preserve the many benefits a healthy coastline provides: flood protection, recreation, habitat for wildlife, water quality and more. 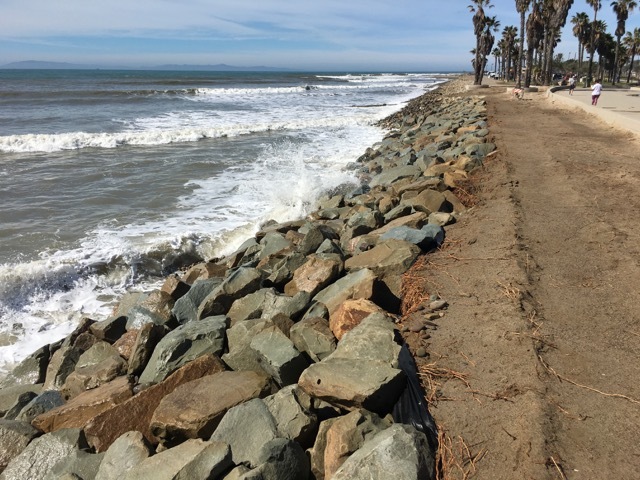 Seawalls and other engineered structures, are commonly installed in order to hold the shoreline in place and hold back the ocean; however, they ultimately make the situation worse in most cases by increasing erosion and thus causing already vulnerable shorelines to shrink more. 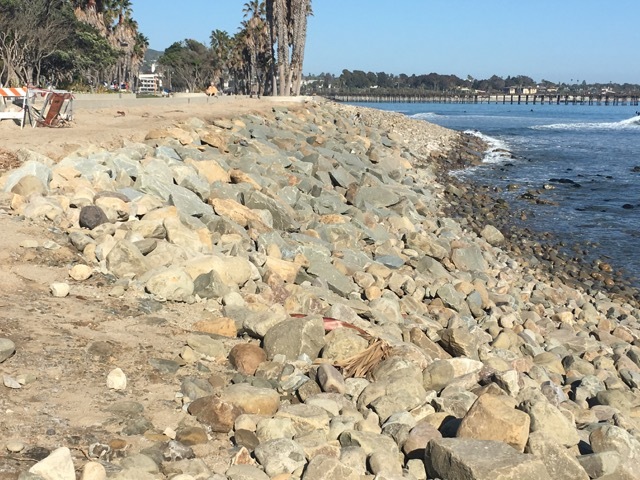 Natural shoreline infrastructure is an alternative that is more likely to preserve the benefits of coastal ecosystems while also maintaining coastal access. 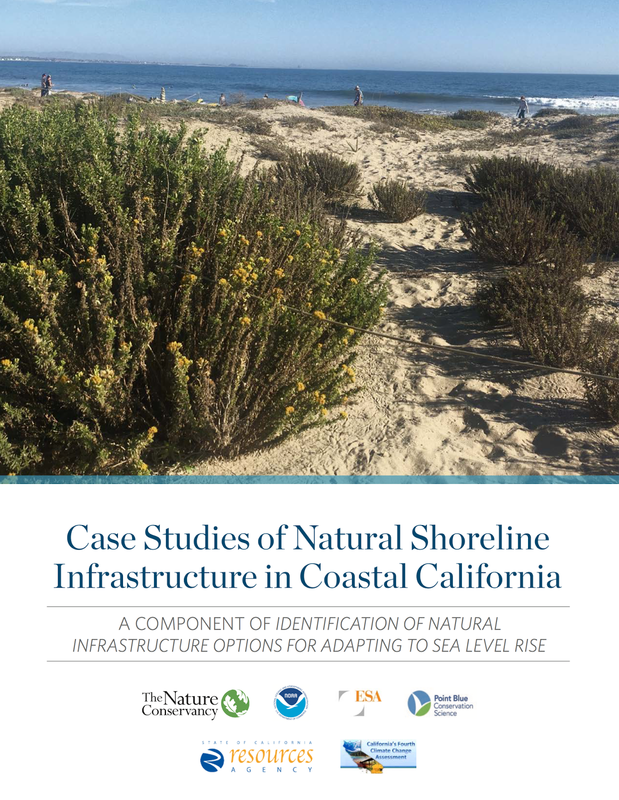 These case studies were designed to be useful examples for coastal planners, local governments, and others working on solutions and making decisions regarding climate-related coastal hazards. 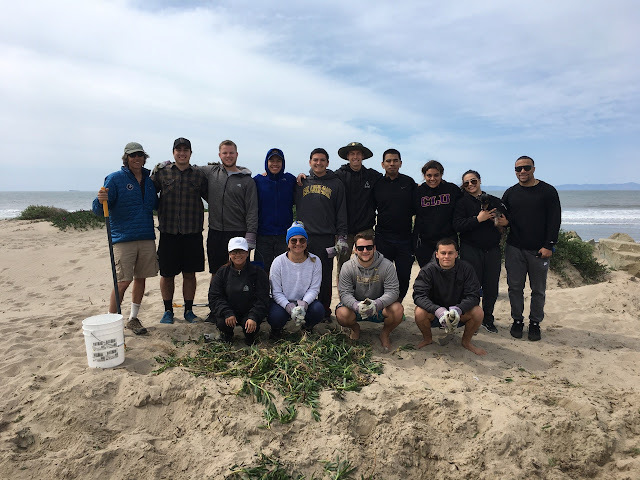 Of these, Surfers' Point and Humboldt Dunes are the only projects implemented on the active coast, while the others are in bays and estuaries which are not directly affected by erosion by ocean waves. And Surfers' Point remains the sole example of managed retreat in response to coastal erosion on a developed shoreline. Restoration of the backshore is a more effective approach to re-establishing shore morphology with desired ecology, restoration, and ecosystem services than the more traditional approach of building the shore seaward. Thanks to a $3.3 million grant from the California Department of Fish and Wildlife, the project will take a huge leap toward completion of the final design phase for removing the dam. “What we’re seeing with dam removal is that a river will restore itself quicker than anyone predicted,” said Jenkin. The good news is coastal systems naturally recover quickly after a dam is removed. But in order for recoveries like that to happen, old dams must be torn down and sediment must be dealt with. Matilija Dam would be a prime candidate. It provides no recreational value, no flood control and no water to the area. It has trapped 8 million cubic yards of sediment in its reservoir, and by 2020, it will be completely silted up. It presents a major safety risk, and its owner, Ventura County, wants it gone. Patagonia, the outdoor gear maker, has thrown its considerable weight — and more than $275,000 — behind the removal effort. The river runs through the backyard of the company's headquarters. "The real aim is to give the beach room to adapt over the course of decades," he said. "In drought, we have a scarcity of sediment in the system and the beach naturally retreats. Then we have a flood cycle and the beach grows back again. Trying to hold that line interrupts the whole process." 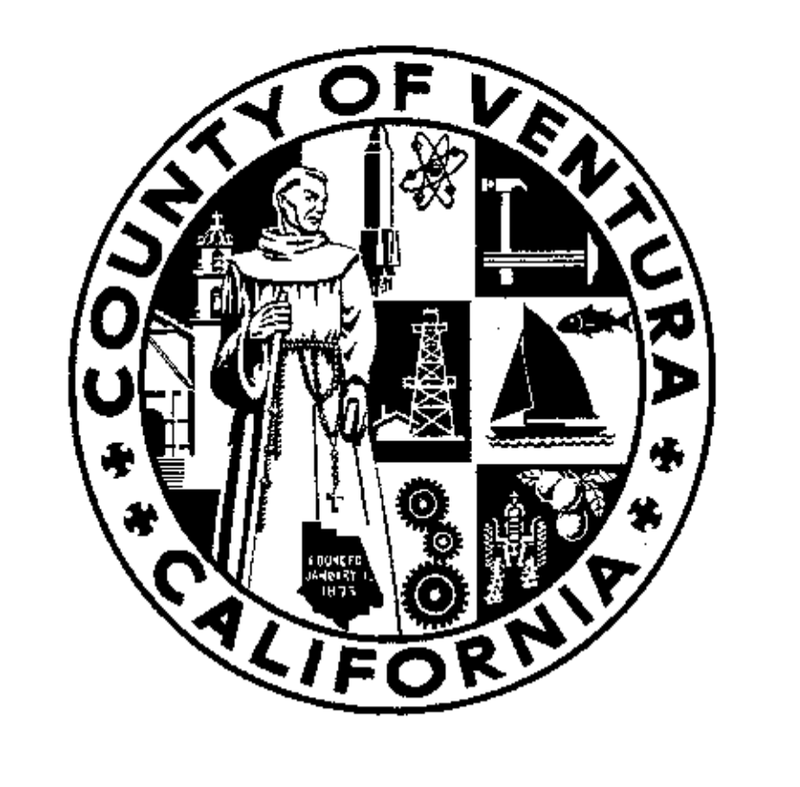 Tuesday May 23, 2017: The Ventura County Board of Supervisors adopted a Resolution Approving and Authorizing the Acceptance of $3,300,504 in California Department of Fish and Wildlife Restoration Grant Funding for the Matilija Dam Removal 65% Design Planning Project; and Authorization for the Ventura County Watershed Protection District (District) Director to Execute the Grant Agreement; Watershed Protection District Zone 1; Supervisorial District No.1. Since 1999, the Ventura County Watershed Protection District (VCWPD) has engaged in a multi-stakeholder effort to remove the obsolete Matilija Dam from the Ventura River watershed. 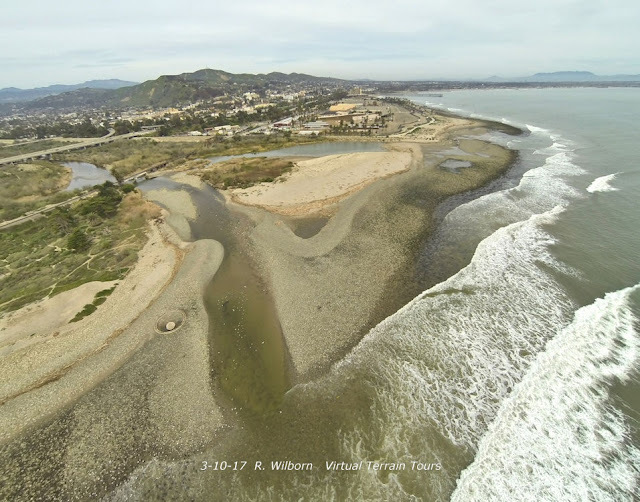 The (Project) is a watershed-scale project with multiple components that will enhance the Ventura River and its tributaries to benefit native wildlife and restore ecosystem function. Importantly, the project will also address the liabilities posed by the obsolete dam and associated downstream infrastructure. While the aging dam is itself an ongoing liability to the County of Ventura, this project also provides the means to upgrade the downstream bridges, levees, and the Robles diversion to accommodate changes in sediment transport and flow elevations in the Ventura River. Each of these downstream projects will address current infrastructure deficiencies that will only worsen if Matilija reservoir is allowed to completely fill with sediment. In March 2016, the Matilija Dam Design Oversight Group (DOG) reached consensus on an approach to dam removal that provides a cost-effective solution to sediment management. 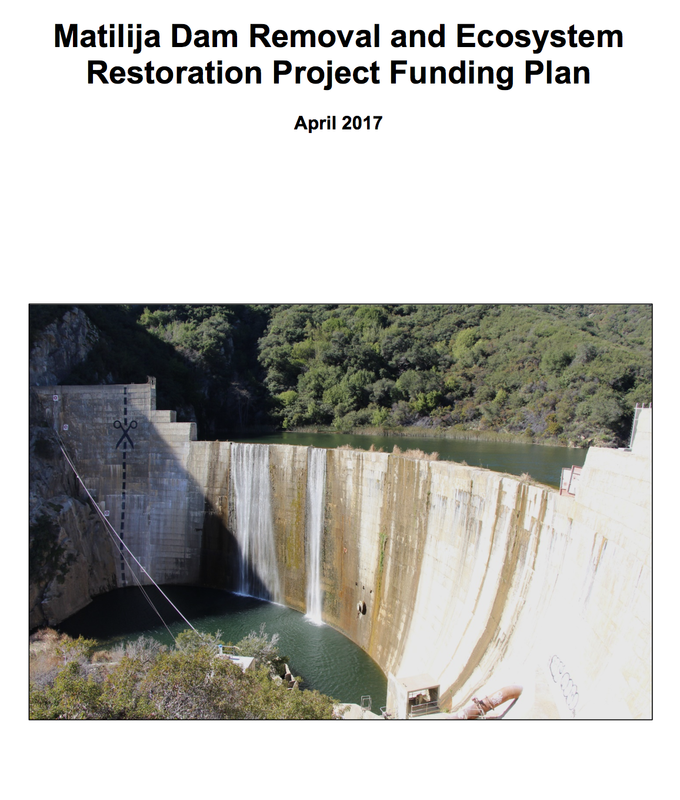 This plan was developed with new information based on the lessons learned from other recently implemented large dam removal projects, which provides an opportunity to greatly reduce the cost of removing Matilija Dam. The Project has demonstrated strong support from public funding sources, as evidenced by the $3.3 million California Department of Fish and Wildlife (CDFW) Grant. There is also significant philanthropic support through the recently- launched “Open Rivers Fund,” a ten-year program of Resources Legacy Fund (RLF). The work plan funded through this California Department of Fish and Wildlife grant will help advance this project to “shovel ready” for future implementation funding opportunities. We are optimistic that, with such broad support, Matilija Dam can be removed in the coming decade. 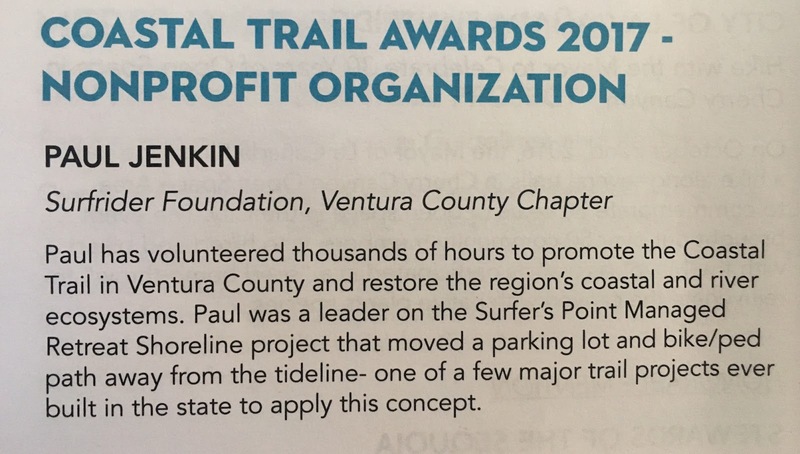 Recognition for the Surfers' Point Managed Retreat Project at last week's California State Parks annual Trails and Greenways Conference. In March 2016, the Matilija Dam Design Oversight Group (DOG) reached consensus on an approach to dam removal that provides a cost-effective solution to sediment management. Following this consensus, the Matilija Funding Subcommittee was formed with volunteers representing various stakeholder groups. The Subcommittee has focused on developing a Funding Plan, while simultaneously pursuing funding opportunities for the Project. 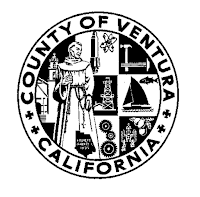 This year, the VCWPD, with support from the Matilija Funding Subcommittee, has secured a $3.3 million California Department of Fish and Wildlife Proposition 1 Grant. This funding will advance the Project to the 65% design phase and complete the environmental and permitting requirements over the next 3 years. The shorter timeline assumes sufficient funding is available to construct all downstream project components simultaneously, during 2021-2022, with dam removal complete by the end of 2024. This “best case scenario” also assumes no waiting period for dam removal following construction of orifices in the face of the dam (i.e., the required high storm event would occur immediately following the construction of the orifices). The longer timeline assumes the same planning schedule, but with sequential, not concurrent, construction of downstream infrastructure and includes a three-year waiting period for dam removal. In this case the dam is not removed until 2031, a 15-year project. 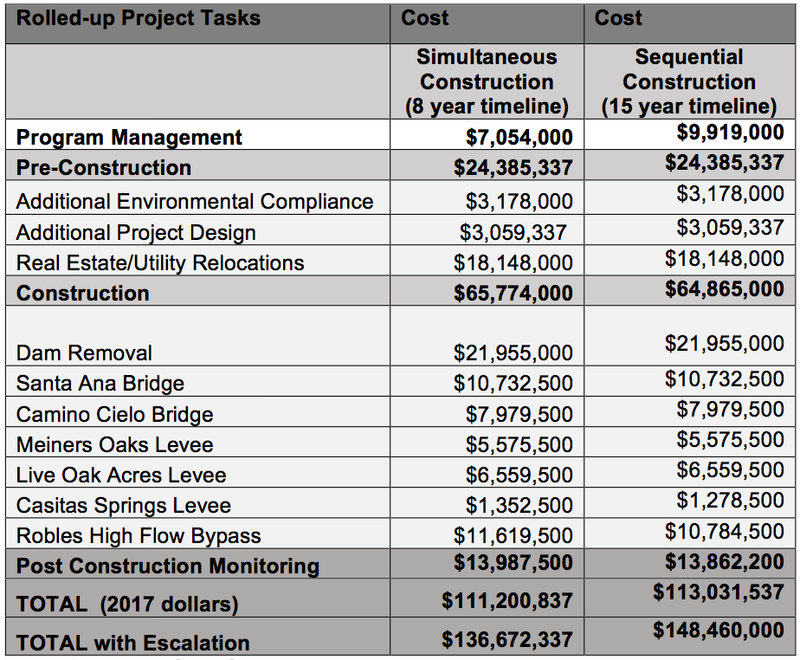 Total cost estimates shown were developed for "2017 dollars" as well as an escalated figure that includes inflation, and projected construction and management cost increases. The proposed “Uncontrolled Orifices with Optional Gates” alternative project ($111M in 2017 dollars) is a more economically feasible and expeditious project than the congressionally authorized Army Corps of Engineers (ACOE) Alternative 4b project ($205.8M in 2017 dollars) that was previously contemplated for the Project. 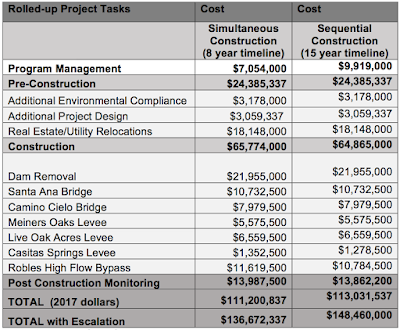 These preliminary estimates also indicate that the overall cost of removing Matilija Dam will increase over time, and that a longer timeline will be subject to both inflation and increased program management costs. Therefore, there is an advantage to completing the project on a shorter timeline, although this would of course be dependent on the availability of funds. Strong support from state agencies, (and unlikely federal appropriations to the original ACOE Project plan), provides a path forward for the less expensive local plan in a timely manner. The report outlines a diverse array of current and potential state, federal, local, and private funding opportunities are potentially available to fully implement the project. 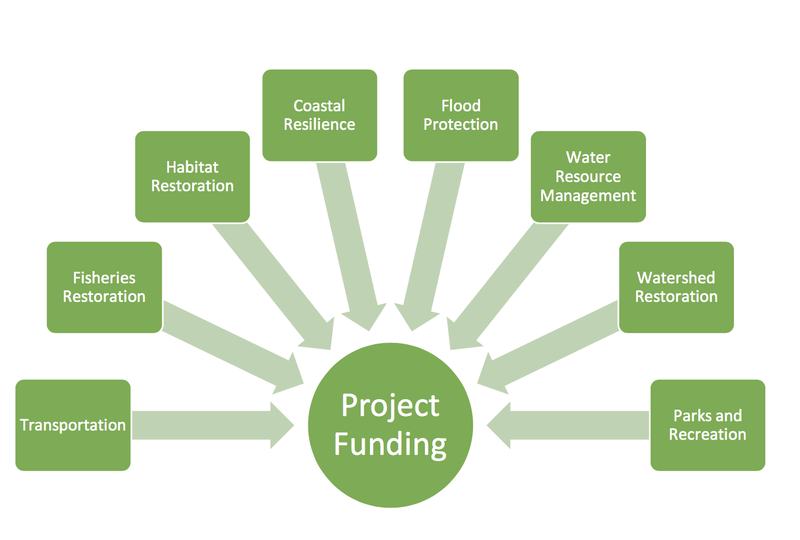 Moving quickly to access the immediately available funding options presented in this plan (particularly CDFW and Coastal Conservancy Prop 1 funding), leads to substantial cost savings over time. But, it’s also important to note that this approach brings the Project to a level of readiness for possible benefit from one of the evolving legislative opportunities. This includes a state water bond or local tax measure pass with provisions favorable to implementation of Project components. However, the County may only be able to apply for and access funding if preliminary design work and downstream components are complete. Having a “shovel ready” project is critical to take advantage of existing state funding and evolving legislative opportunities. If successful, this strategy will not only lead to dam removal sooner, but significantly reduce the overall cost of the Project. 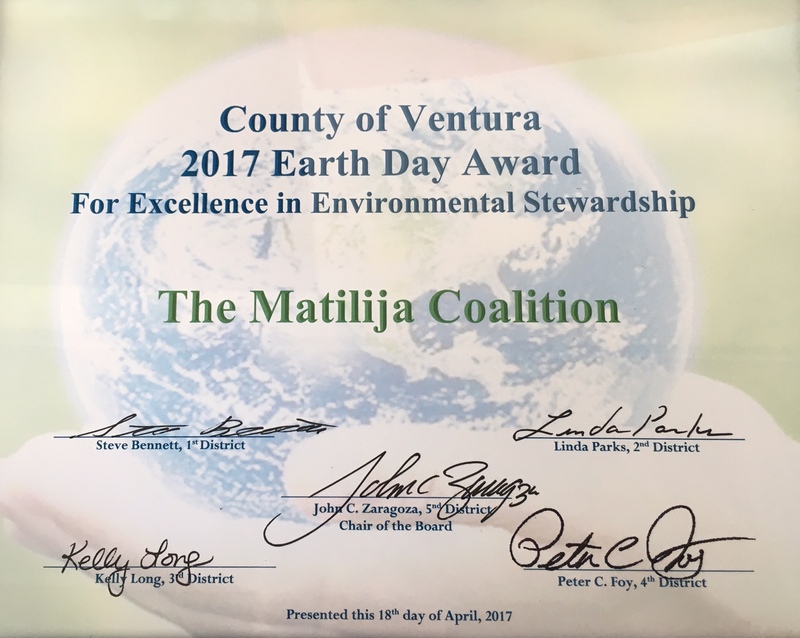 April 18, 2017: the Ventura County Board of Supervisors recognized the Matilija Coalition for "Excellence in Environmental Stewardship" as part of their Earth Day awards. 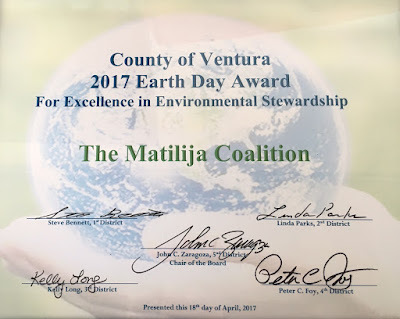 The Matilija Coalition is an alliance of community groups, businesses, and individuals committed to the environmental restoration of the Ventura River watershed. Since 2000, the Matilija Coalition has worked to achieve the following vision: a free-flowing Ventura River from the mountains to the sea; a thriving population of steelhead trout in its waters; a healthy, native ecosystem; a wide, sandy beach along the coast; and opportunities for public enjoyment, education, and recreation for current and future generations. 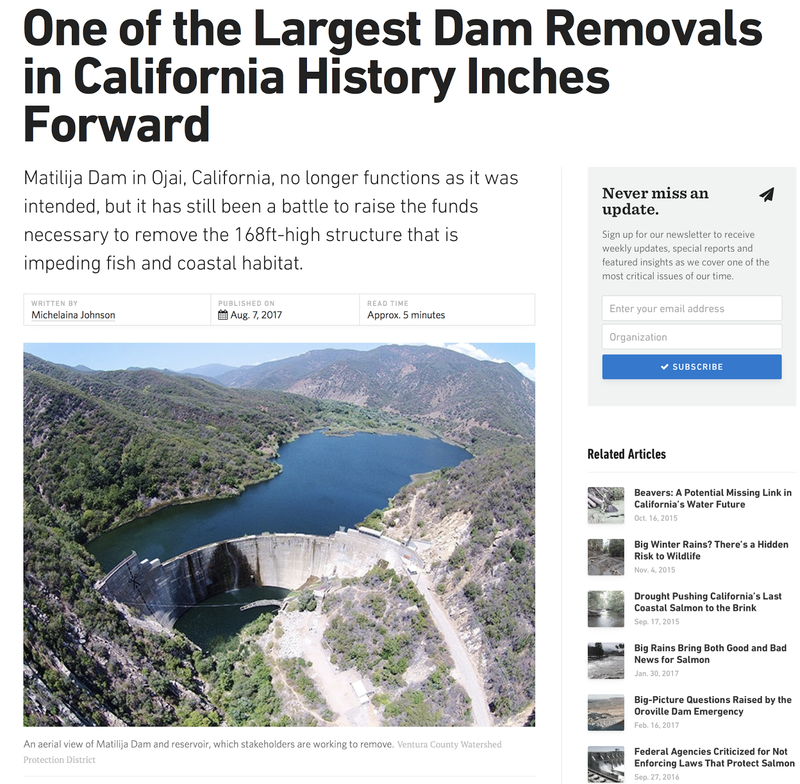 The Matilija Coalition and its members have played an integral role in the multiagency Matilija Dam Ecosystem Restoration Project, and the Matilija Coalition steadfastly advocates for an ecologically sensitive, cost effective, and timely removal of Matilija Dam. The Coalition has maintained an active role in the various technical working groups and, through many years of this work, helped achieve the 2016 consensus decision reached by stakeholder agencies around a preferred dam removal alternative. 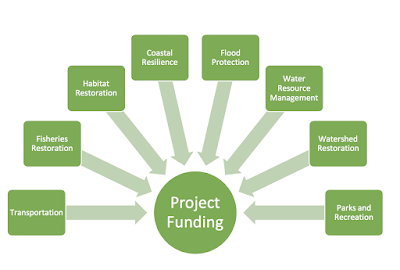 Since spring 2016, members of the Coalition have helped lead the effort to identify sources of funding for the Matilija project, and have been instrumental in seeing state and private funders commit to supporting the next phase of the project through California Department of Fish and Wildlife’s Prop 1 Watershed Restoration Grants program and the new “Open Rivers Fund”, a project of the Hewlett Foundation and Resources Legacy Fund. 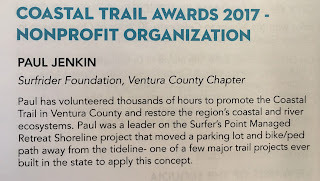 On a watershed level, the Coalition has helped lead and maintain the Friends of the Ventura River group, which was responsible for development of a Ventura River Parkway vision and trail guide. The trail guide has become a popular resource locally, and is available in both English and Spanish. In 2014 Ventura River Parkway Trail was dedicated as a National Recreation Trail. The Friends of the Ventura River website includes an archive of relevant technical and historical documents. Surfrider and the City of Ventura continue to sponsor volunteer work days at Surfers Point. 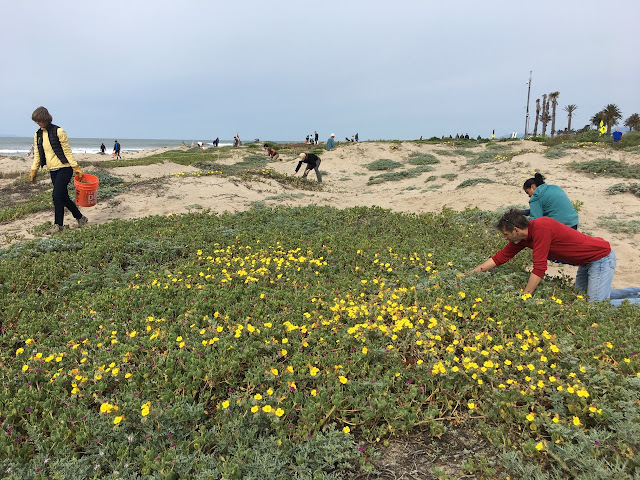 Spring weeding is an ongoing part of the ongoing dune restoration process. 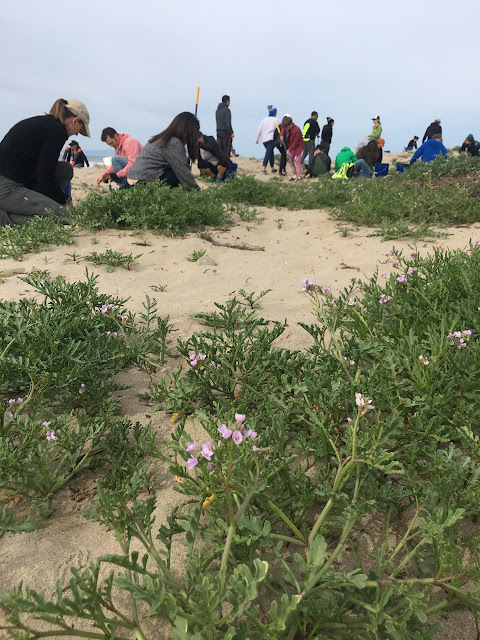 The two events this year focused once again on the non-native plants "Sea Rocket" and "Ice Plant." Over 20 volunteers came out for the morning on February 11, with over 50 on April 9. The timing was perfect, with the opportunity to remove fresh sprouts in February and the remainder before seeds matured in April, so that next year we should see reduced re-sprouting. The LA Times reports that last winter's El Niño triggered unprecedented erosion across California's coast. 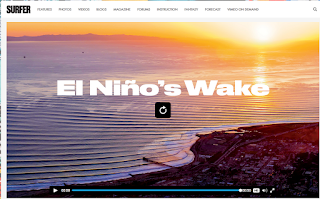 The article highlights research analyzing last year's El Nino storm track that brought us one of the best winter surf seasons on record. 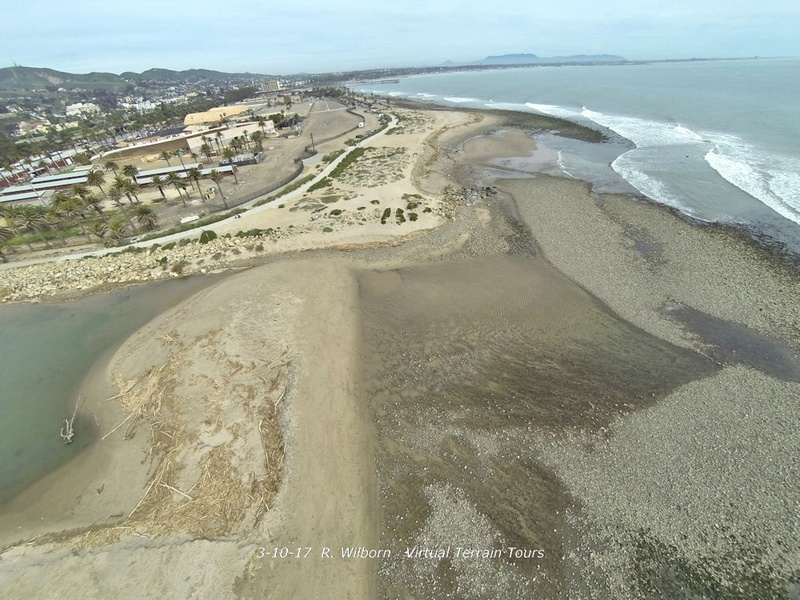 This new research confirms what we observed in Ventura: the combination of large waves and drought drove unprecedented levels of winter shoreline retreat. But last year another force was in play; rising sea levels. The paper states that "Water levels anomalies of 7–17 cm above normal were measured across the US West Coast during the El Niño winter of 2015–2016, similar to anticipated global mean sea-level increases expected within the next few decades." How will rising sea levels affect surfing in the future? 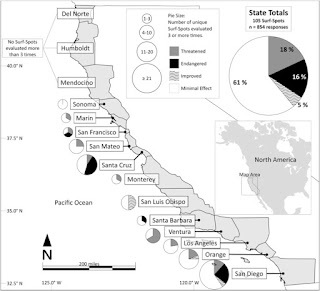 This topic is explored in a new paper titled Using local knowledge to project sea level rise impacts on wave resources in California published in the journal Ocean & Coastal Management. Sea level rise will likely impact the quality of surf-spots; in California that impact will be a net reduction in overall wave quality at current surf-spots. 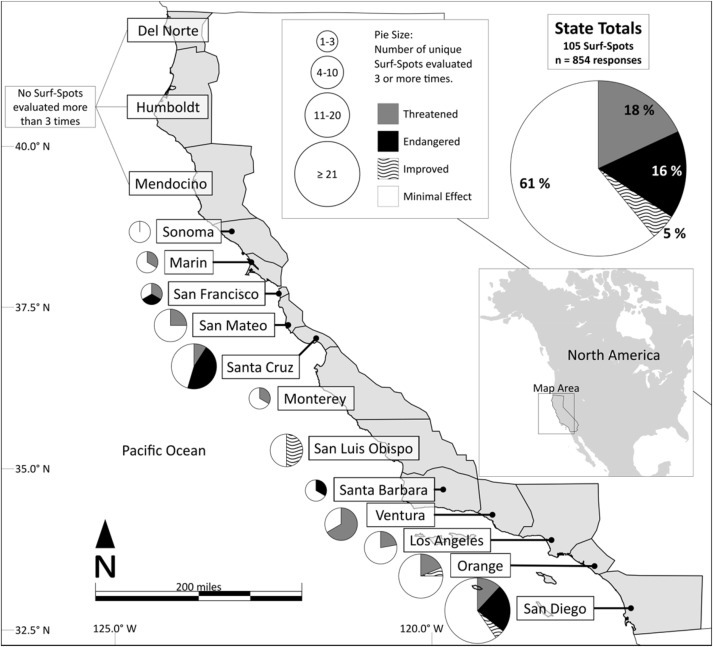 Vulnerability of surf-spots to sea level rise varies geographically, with some surf-spots and some regions experiencing more significant reductions in wave quality; due to sea level rise, roughly 18% of surf-spots evaluated here are Threatened by drowning and 16% are Endangered; 5% could improve. Surfers' local ecological knowledge of waves constitutes a measureable source of data about environmental condition and variation. As sea level rises locally, surf-spots that break at low tide, or medium tide, or high-tide will be increasingly and sequentially inundated: the water will simply be too deep for them to experience their best conditions. And perhaps most relevant to our local situation, in areas where landward migration of the beach is not permitted, either through seawalls or natural marine terraces, the beach will be "drowned." 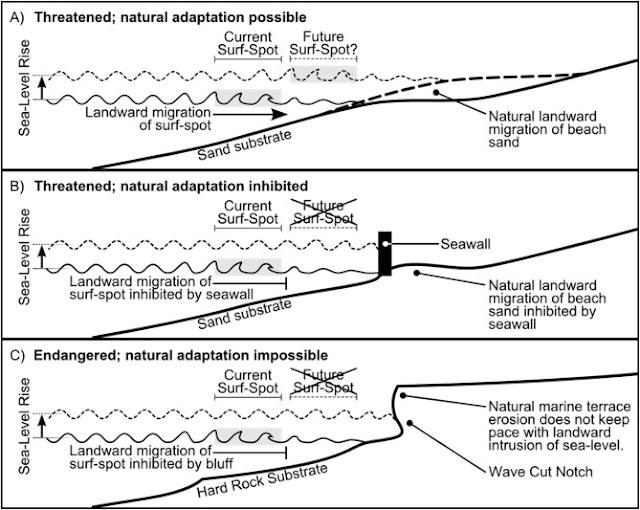 Given the vast economic and cultural importance of surfing, these conclusions suggest that coastal managers should not only give credence to the wave knowledge of surfers, but also take wave quality and vulnerability into consideration, especially when planning coastal armoring, beach nourishment, or other developments, whose impacts to natural coastal processes could affect waves. Extreme oceanographic forcing and coastal response due to the 2015–2016 El Niño. Barnard, P. L. et al. Nat. Commun. 8, 14365 doi: 10.1038/ncomms14365 (2017). The storm of Friday, February 17, 2017 delivered 9-10" of rain to the Matilija Canyon watershed. Flows in Matilja Creek peaked at 4pm with approximately 7500 cfs (cubic feet per second) flowing over the dam. The Ventura River at Foster Park peaked over 20,000 cfs later that evening. Studies completed last year determined that the minimum high flow event on Matilija Creek that is assumed to be able to transport the large quantities of fine sediment over a short period of time is a storm having an average daily flow of at least 1,700 cfs, corresponding to a peak daily flow of about 3,000 cfs (Stillwater Sciences, 2014b). This is approximately a 4‐year recurrence interval on Matilija Creek. Although much work remains until the project is ready, a storm like this will exceed that required for the eventual removal of Matilija Dam. 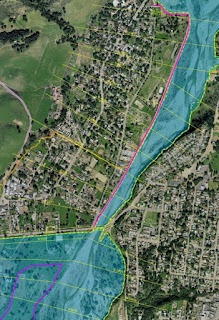 Coalition who collectively commented on a draft alternatives analysis for the emergency permit. The coalition is working to ensure the final permit addresses potential alternatives and that any future work has the least impact to the recreational and aesthetic values of our beach. 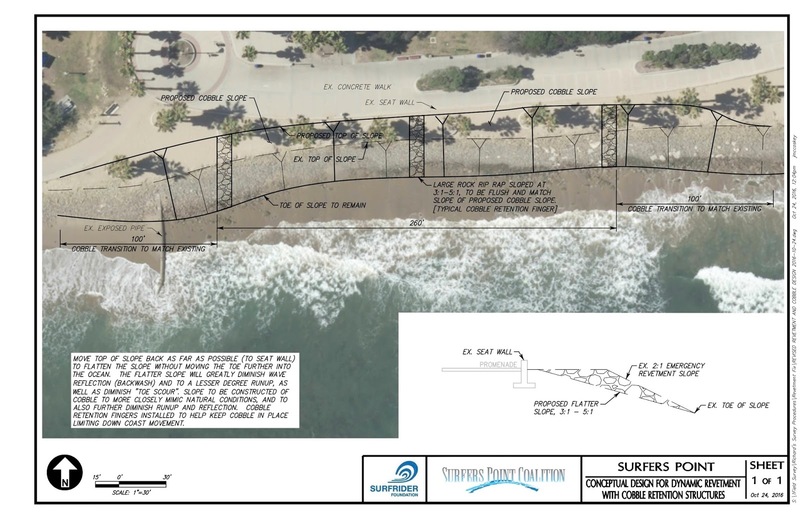 In further communications, Surfrider voiced concerns that shoreline armoring would adversely impact the beach and the high value recreational opportunities at the famed "C-St" surf break. Under the Coastal Act, an emergency permit is conditional and requires that the permittee follow up and apply for a final permit which, among other things, requires an alternative analysis. The city initiated this process which has so far included two "stakeholder" meetings. Several people who had contacted the City to voice their concerns were included in these meetings, which led to the formation of the Surfers’ Point Coalition. These stakeholders include local surfers with many years experience at Surfers’ Point, as well as expertise in ocean engineering, engineering design, project permitting, and “real world” water time. The Coalition submitted comments to a draft Alternatives Analysis which is currently under revision. Compatibility with the US Army Corps of Engineers requirements required an extension of the timeline, and subsequent withdrawal of the permit application. The project will require both an Army Corps and Coastal Commission permit. The current schedule anticipates an opportunity to review the updated analysis in April with final permit applications submitted to Corps and Coastal Commission in May. The Surfers' Point Coalition proposed a modification to one of the alternatives presented in the analysis. 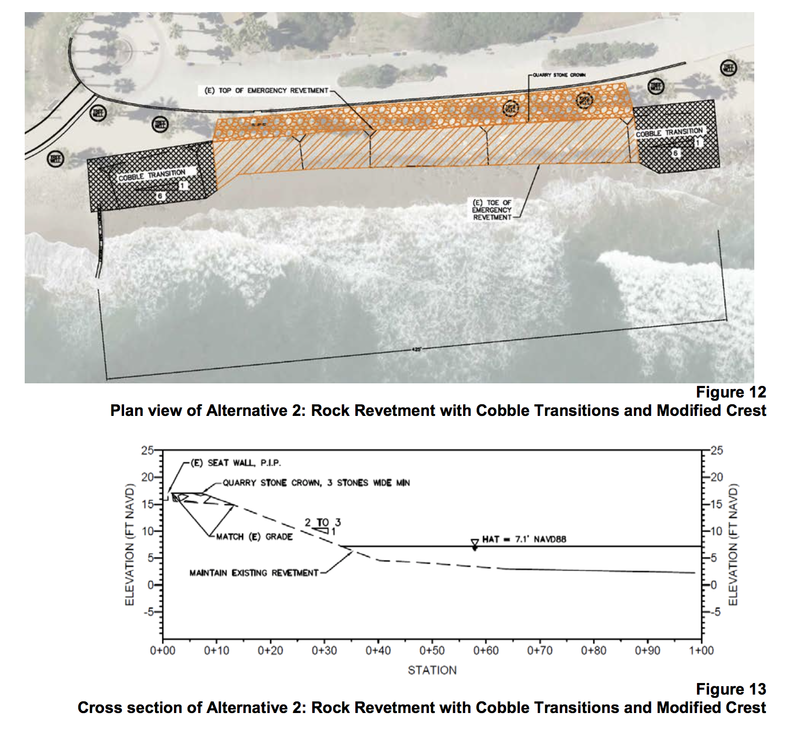 As noted in our comments on the Alternatives Analysis, there is merit in developing a strategy to retain cobble on the beach face at Surfers’ Point. While the past cobble nourishment provided effective shore protection, the benefit is unfortunately short lived due to the high rate of longshore transport at the point. The attached concept modifies the profile of the Low-Profile Groins with Cobble Nourishment alternative to better match the shoreline dynamics while minimizing the regulatory footprint. These structures should be designed with large enough boulders such that they will withstand extreme surf conditions, serving to establish semi-permanent “pocket beaches” backfilled with cobble. The spacing and elevation shown on the drawing should be considered a starting point for further design. 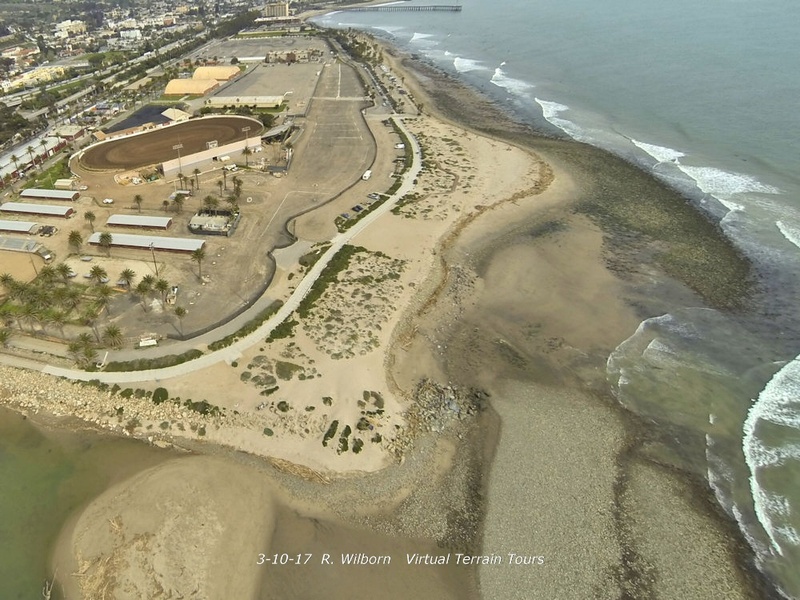 As the Alternatives Analysis points out, the City of Ventura has been very proactive in experimenting with alternative shore protection strategies. Given this history, it would be appropriate at this time to develop an engineering solution that would provide multiple benefits without adversely impacting the aesthetic and recreational qualities of Surfers’ Point. 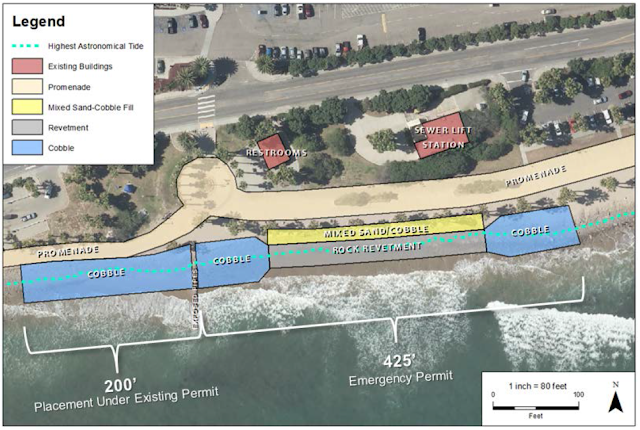 If this experimental solution proves viable, it can be duplicated along the remainder of the beach fronting the promenade as needed in the future. History, science, and personal experience has shown that emergency responses to beach erosion can lead to piecemeal coastal armoring. This was evident at Surfers' Point during the last erosional cycle of 1991-1995, shortly after the bike path was extended along the beach at the fairgrounds. 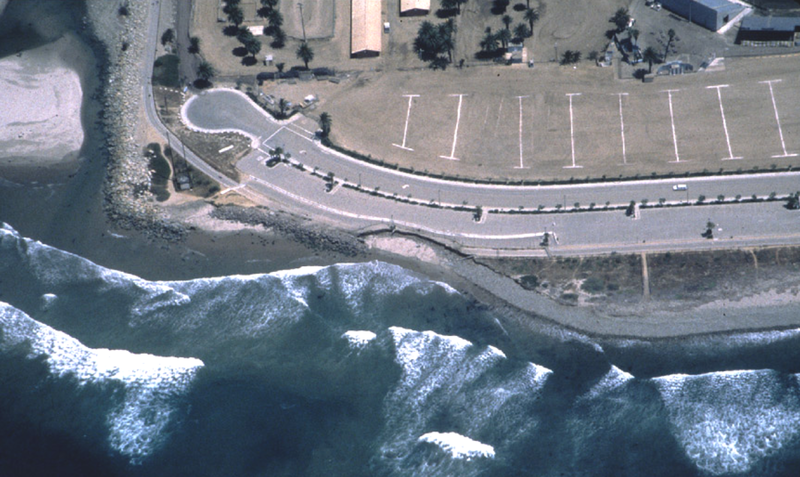 The emergency revetment placed in 1991 exacerbated erosion on the adjacent shoreline resulting in the closure of a damaged section of parking lot for 15 years until the managed retreat project was constructed. 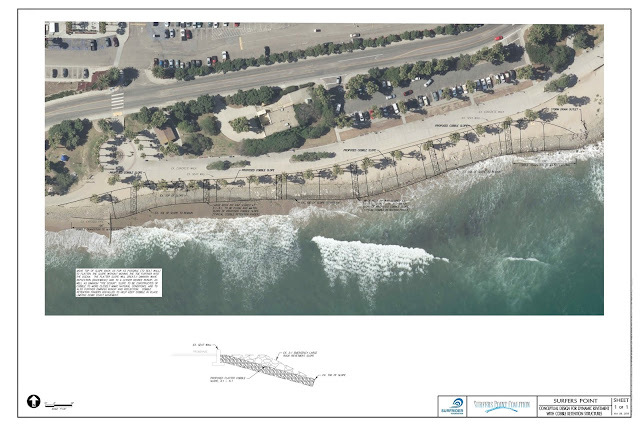 A holistic approach that considers the shoreline as a contiguous system is required to effectively manage the coast. 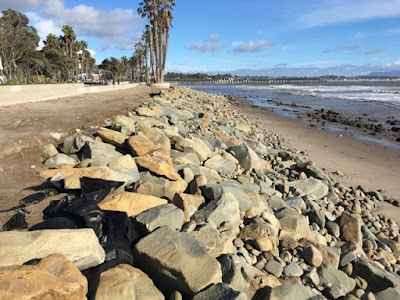 Otherwise the public beach will slowly be replaced with progressively larger rocks in response to each erosion episode, forever changing the character of this valued resource. The final Alternatives Analysis was re-formatted to comply with US Army Corps of Engineers requirements on June 1. This document was shared with stakeholders and discussed in a stakeholder meeting on June 16. A preferred alternative was agreed upon, which included modifications to the crest of the revetment and installation of experimental "cobble retention" finger groins to try to retain sediment in front of the structure. We noted that the Cumulative Impacts section of the Corps document was blank, and the response to our request for this information was to file a Freedom of Information Act (FOIA) request. Subsequent discussions with Coastal Commission staff revealed that the agency would not support the experimental structural modifications to the revetment, so the City will proceed with plans and permitting to simply modify the crest to mitigate erosion resulting for wave overtopping.